It’s not the best photograph, of course—it was pitch black (hence the flash and the red-eye, which I thought of reducing in iPhoto, but it just made him look weird); I didn’t want to spook him by getting too close, and had to essentially guess where he was. So, actually, not such a bad photo under the circumstances. 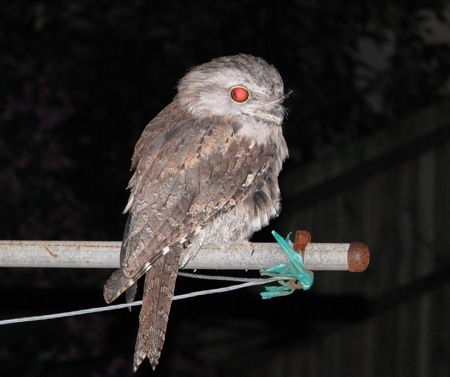 (Nick tells me that I should mention that this beautiful boy is a Tawny Frogmouth (and I’m so pleased to see that they’re at low risk of extinction, the lovely things). I just assumed everyone would know that, which just goes to show that I shouldn’t be writing on the Internet. Previously: Strange Conversations: Part Eighty Next: Wondering Why I Haven't Been Blogging Much Lately? Patience. I am actually at this moment working on an entirely humourless explanation for why I haven’t been blogging much.